On June 10, 1956, 50 years ago, the company now known as Dr. Ing. h.c. F. Porsche AG, Stuttgart, celebrated one of its biggest and most important racing victories. Italian racing driver Umberto Maglioli was the surprise overall winner in a Porsche 550 A Spyder at what was then the world’s longest-standing and most difficult road race, the Targo Florio, in Sicily. The young Porsche company gained worldwide recognition with this victory, as it was the first time that a driver in a smaller class of racing vehicle (of up to two litres engine capacity) managed to beat vehicles with a higher cylinder displacement. With an average speed of 90.9 km/h and a lead of nearly 15 minutes on the second place vehicle, Maglioli not only out-classed the competition but also assured the first overall victory for Porsche in the World Championship. 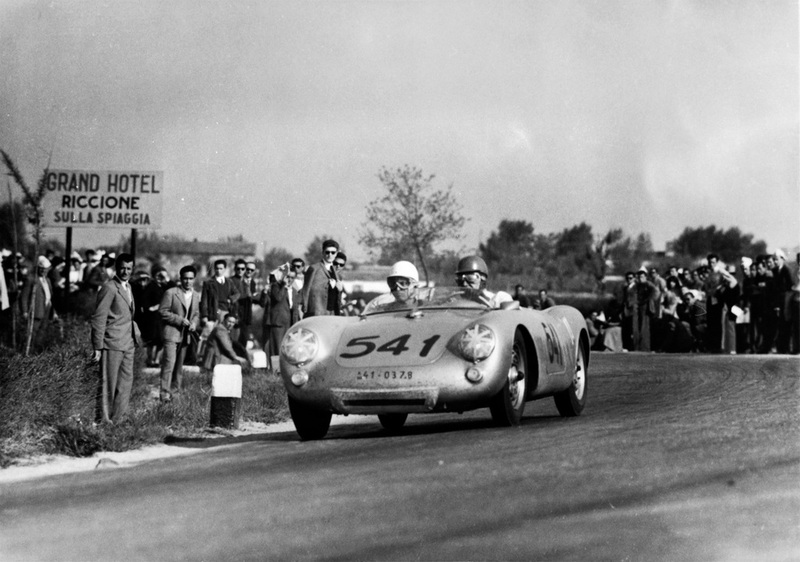 This victory was made all the more surprising because of the fact that the Porsche 550 A Spyder only debuted eleven days before the Targa Florio at a 1,000 kilometre race on the Nurburgring in Germany. Spurred on by the victory in this class, the Head of Racing at Porsche, Huschke von Hanstein, traveled to Sicily with driver Maglioli and two mechanics to test the open-top Spyder’s competitiveness once again. In contrast to other road races of the time, routes were not closed during training, so the drivers always had to be prepared for traffic and other obstacles. Furthermore, for Porsche it was the first time it took part in this legendary race as, at the time, the Targo Florio was seen as the territory of large Italian racing stables. Maglioli completed the 720 kilometre route without changing drivers in a time of 7:54.52 hours and thanks to the reliability of his Porsche, only pulled into the pit stop to refuel.